Paul Barret of Pdb3 worked with Sydney’s The P.A. 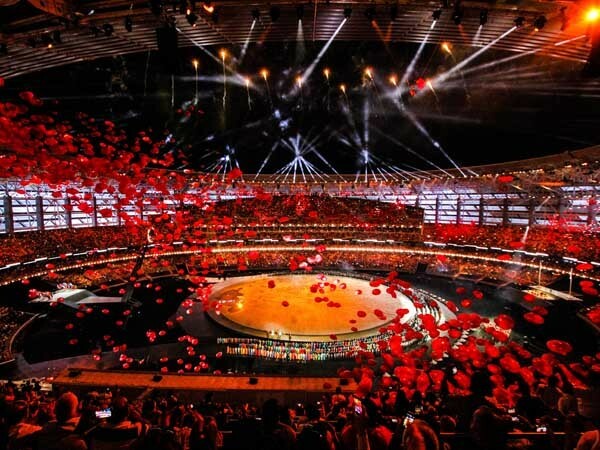 People to design the communications system for the opening ceremony of the inaugural European Games in Baku, Azerbaijan. Pdb3 specialises in creating turnkey solutions for major event communications. Designing the communications system for this major event was a daunting task, which involved equipping hundreds of technicians, stage managers, performers and ancillary staff with the tools to communicate clearly, quickly and flexibly across multiple sites, in multiple configurations, without missing a beat. Pdb3 partnered with The P.A. People to ensure the spectacular celebration of Azerbaijani culture and European harmony. To meet the heavy demands on the comms system, Paul relied on the scalability of Clear-Com to achieve project goals. According to Paul, The P.A. People had two Clear-Com Eclipse HX-Omega digital matrix systems, two Eclipse HX Median Digital Matrix frames, nine HelixNet Master Stations, 70 HelixNet Beltpacks, more than 200 Clear-Com V-Series intercom panels, and Freespeak II with 80 wireless beltpacks, all interfacing into 100 two-way radio channels using Clear-Com FOR-22 cards and GPI cards. Paul had additional on-site support from two Clear-Com engineers for two weeks. The project received excellent factory support from Clear-Com including software changes made with a 24-hour turnaround. Being able to interface so many different types of comms and expand or contract according to demand was key to the choice of Clear-Com equipment. Paul explains that Clear-Com is his preferred solution for projects that require systems to be scaled. Clear-Com is a comms system with a comms-focussed approach, whereas other companies tend to approach their designs as a signal distribution system that also does comms. He adds that Clear-Com gives them more flexibility to do their job. Paul and the team made extensive use of Clear-Com’s ability to connect over IP to address the scale and distances involved in the project. According to Paul, the IP network was extensive with fibre optic cable run from the main stadium to the boulevard on the Caspian Sea, where there was a secondary cauldron and a secondary fireworks display. They also had V-Stations on the other end, and were sending and receiving timecode and CCTV. Clear-Com allowed them to move everything onto IP, while giving them the option to go back to analogue. One of the most innovative components of this vast comms system was the integration of 80 full duplex wireless Freespeak II beltpacks. The Freespeak II system at Baku won widespread praise from all of the assembled technical staff for its clarity and functionality. Paul is confident he will specify Clear-Com in all of his future jobs thanks to his experience with Freespeak II. Back in Australia, Paul will be integrating Freespeak II systems into a variety of major corporate events where two-way radios aren’t a good fit. He explains that the nature of the venues demand the use of distributed antennas. Freespeak II gives so much more flexibility to put people on wireless while also delivering excellent sound quality.